Which are the best portable ironing blanket available in 2019? Laundry Machines Cover - The mat measures 33 1/2" x 19", it will fit completely atop most standard sized countertop or washer/dryers. Easy to fold up and store with minimal use of space, it also doubles as a convenient padding protector for your washer or dryer tops, keeping the surface safe from dust, scratching, and other minor surface damage. 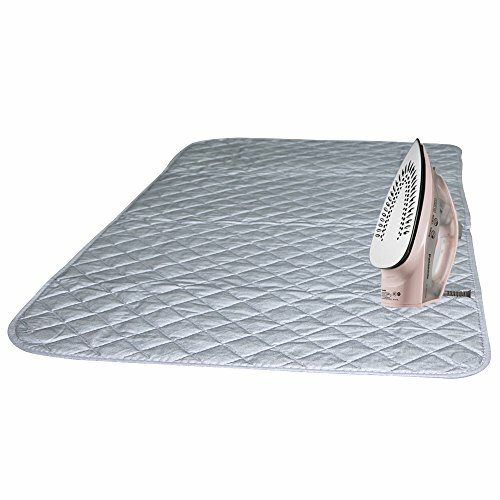 Ironing Blanket Pad - Foldable and easy to take with trips. This mat serves as a clever alternative to traditional ironing boards, proving especially valuable to those who reside in studio apartment, dormitories, RVs, or other smaller living spaces that may not be able to facilitate bulky ironing boards. Magnetic Laundry Pad - Transforms any metallic or flat surface into an instant ironing board. Its padding is made from high quality quilted polyester-cotton fabric that can withstand high heats up to 500F. Each corner of the mat contains a heavy-duty magnet that attaches itself to any metallic body surface for a secure hold while you iron. Durable Ironing Board - Whether all you need is a quick touch up on a garment after it's been pulled from the dryer, or you are tackling a load of heavier garments, this ironing mat can handle any sized ironing job. Its portability makes it a perfect traveling accessory, anywhere you may roam. Ironing Pad Covers - Good quality and not flimsy. Fits perfectly over the washer and magnets on both sides hold it in place. Great for sewing projects or if you just have a few things to iron. Notice: Use this on hard surfaces such as washers and dryers, we advise to avoid using this directly on wood or plastic! Transforms any metallic or flat surface into an instant ironing board. Its padding is made from high quality quilted polyester-cotton fabric that can withstand high heats up to 500F. Each corner of the mat contains a heavy-duty magnet that attaches itself to any metallic body surface for a secure hold while you iron. The mat measures 33 1/2" x 19", it will fit completely atop most standard sized countertop or washer/dryers. Easy to fold up and store with minimal use of space, it also doubles as a convenient padding protector for your washer or dryer tops, keeping the surface safe from dust, scratching, and other minor surface damage. Foldable and easy to take with trips. This mat serves as a clever alternative to traditional ironing boards, proving especially valuable to those who reside in studio apartment, dormitories, RVs, or other smaller living spaces that may not be able to facilitate bulky ironing boards. Whether all you need is a quick touch up on a garment after it's been pulled from the dryer, or you are tackling a load of heavier garments, this ironing mat can handle any sized ironing job. Its portability makes it a perfect traveling accessory, anywhere you may roam. Good quality and not flimsy. Fits perfectly over the washer and magnets on both sides hold it in place. Great for sewing projects or if you just have a few things to iron. Notice: Use this on hard surfaces such as washers and dryers, we advise to avoid using this directly on wood or plastic!